Nostalgia can be a powerful force. I am certainly very susceptible to it, and in the 21st century, thanks to the proliferation of the internet and personal websites, it is always possible to find someone who is passionate about a subject that you enjoyed in years gone by. My wife it seems can also feel the tug of yesteryear. Though born and raised in England, her parents are Welsh, which meant many trips down the M4 to south Wales as a child to visit family. These journeys also included some vacations, including coastal villages and towns which boast some of the most beautiful beaches in the world (even if the weather does not always match the majesty of the sand!). A couple of years ago, she decided she would like to return to Saundersfoot in Pembrokeshire for her 30th birthday, having spent a few happy weeks there as a small child. Short story version, we had a wonderful time and vowed we would return. Two years later and we decided that another visit across the early May bank holiday week would be a great way to start our 2018 vacations. Saundersfoot is a large coastal resort with a population of just under 3,000 people located between Tenby and Amroth in Pembrokeshire in south-west Wales. The small fishing village was transformed in 1829 when a harbour which is adjacent to the large sandy beach, was constructed to allow ships to be loaded with locally mined anthracite to then be exported by sea. A decree from Queen Victoria stated that only coal from these mines was to be used in the first royal steam yacht as it burned intensely, but produced little smoke. View of the deserted beach in the early evening as seen from the harbour. Those mines that supplied the harbour have long since closed and today the primary industry is tourism, thanks to its sandy, blue flag beach located next to the harbour, and proximity to other well-known tourist destinations such as picturesque Tenby, with its colourful houses and four beaches, 3 miles to the south. There are a large number of accommodation choices including, hotels, B&B, cottages and apartments in and around Saundersfoot. 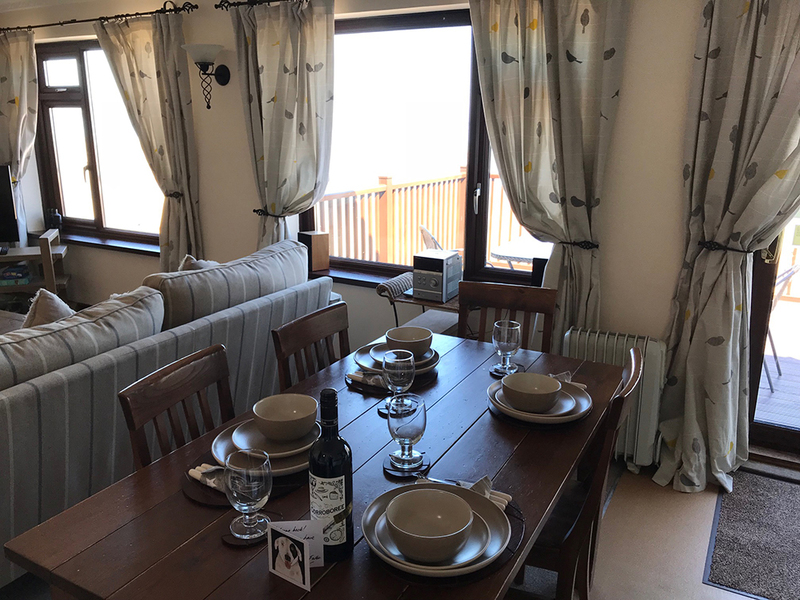 Using Coastalcottages.co.uk, we decided to book the same three-bedroom, two-bathroom apartment which is centrally located on The Strand, above a row of pretty local shops, which served us so well in 2016. The apartment enjoys panoramic views of the golden beach with an eastly aspect, as well as a multi-tiered terrace which leads directly down to the sand. Rounding out the property, is a large, open plan kitchen, diner and living room area with TV, DVD player and a variety of books and board games. All the parking nearby is by meter, but fortunately the flat comes with an annual parking pass which can be left on the dashboard allowing use of the large Pay & Display carpark which is only a few metres away without charge. The dining area in the open plan living room of our apartment on the Strand. Naturally, with a large, gently curved, golden sandy beach, many days can be whiled away relaxing on the east facing beach if you wish. However, there are plenty of other activities to keep you occupied if you need a bit more action in your life. For us the highlight is the Pembrokeshire Costal Path, which can be hiked for miles to all the adjoining towns and villages. We completed two walks during our stay, including to the picture-postcard town of Tenby which is about three miles away, but includes several climbs and descents and some rough bluebell lined, forest terrain which makes it a bit more challenging than the distance would suggest. There are reasonably frequent buses back to Saundersfoot if you do not fancy the reverse path back. 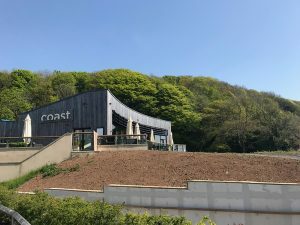 The jewel in the culinary crown of Saundersfoot, Coast is highly recommended. In recent years, Saundersfoot has cultivated a reputation as a gourmet destination with a number of restaurants and pubs serving food and drink at a variety of price points. The jewel in the crown is Coast. 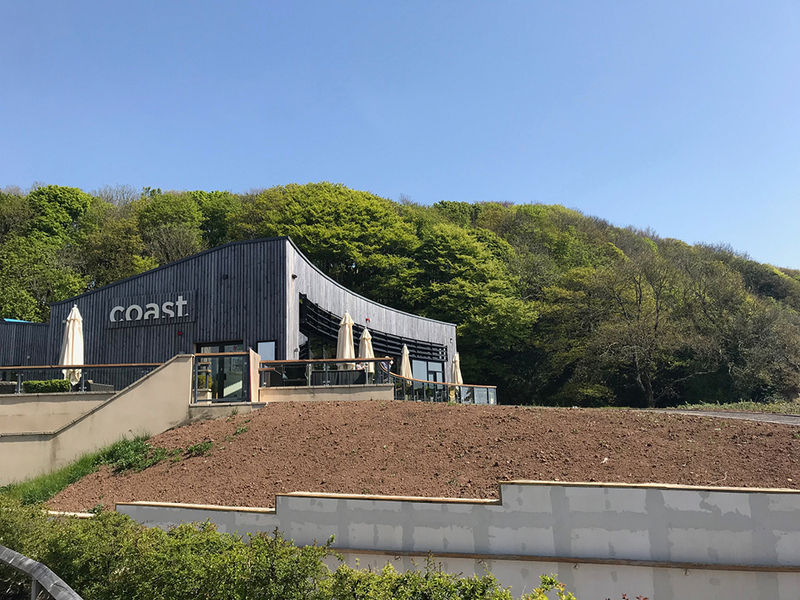 Located in a purpose-built building at the north end of the beach, which allows it enjoy uninterrupted views of the sea, the food is more than a match for the wonderful scenery that can be enjoyed with from inside the restaurant or on the extensive terrace (when the weather allows). 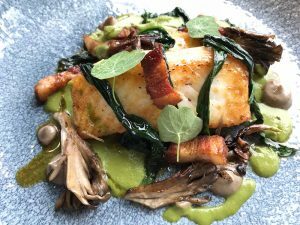 Opened several years ago by internationally renowned chef, Will Holland, the restaurant aims to utilise as much local Pembrokeshire produce as possible in the creation of its wonderful dishes. 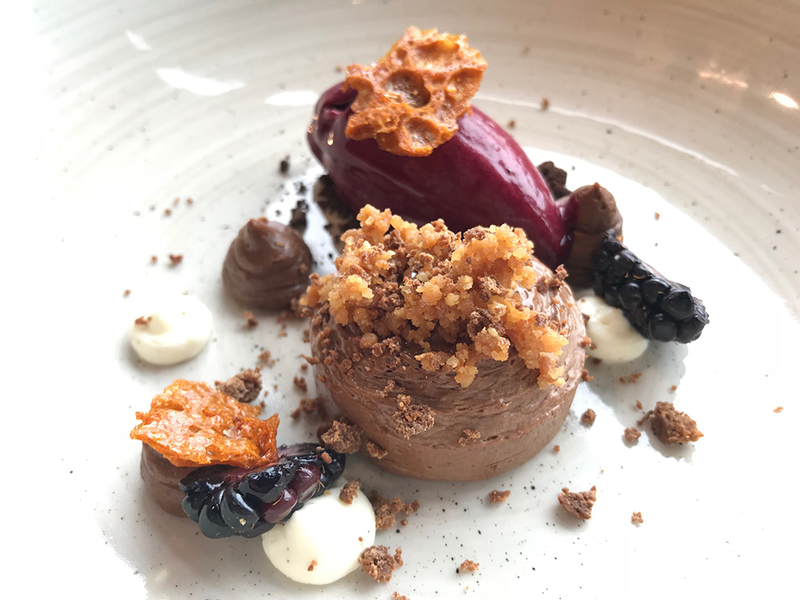 Will Holland had moved on since our last visit in 2016, but new chef Tom Hine has continued deliver, and we saw no change from the high standards during our two visits, once for lunch and once for dinner, during our stay. While we had a well-equipped kitchen, we could not resist the temptation to try a number of eateries during our stay, including the Mulberry, which delivered a declious Sunday roast, as well as some excellent fish and chips from Marina Fish which is located on the edge of the substantial carpark, adjacent to the beach and harbour. Recent addition to the culinary landscape, The Stone Crab delighted with some fantastic seafood dishes, though also have offerings for those who prefer their food to be grazers rather than swimmers. One of the wonderful desserts we enjoyed on our two visits to Coast. I will take almost any opportunity to squeeze in some stargazing, especially if I am travelling away from the heavily light-polluted skies of central London. Staying in the same accommodation previously, I knew the beach-front apartment benefitted from a multi-tiered terrace and balcony which provides an ideal vantage point for some stargazing. Naturally that meant a scope was packed into the car. This time I decided to take my 3” Takahashi FC-76 DCU fluorite Apo refractor. I also took the 1.7x CQ Module from my Takahashi FS-60Q as I had discovered (by reading the FC-76 Objective Unit manual – who does that?!) that it could also be used with the FC-76 to turn it into an f/12.6 quadruplet Super-Apo. That was something I had to try! The Takahashi FC-76Q set up on the balcony of the apartment, ready for darkness to fall. The scope was mounted on my Tele Optic Giro Mini Alt Az which sat on the incredibly portable, but very stable Gitzo GT 4552TS carbon fibre tripod. The scope, mount and tripod combined weigh only around 5kg which means the entire rig can be lifted one handed which meant moving up and down levels to maximise sky coverage is an easy affair. Observing accessories included a variety of Tele Vue eyepieces including the 24mm Panoptic, 14mm Delos and 3-6mm Nagler Zoom, as well as a UHC filter and Sky Safari 5 Pro on my iPhone to provide the star charts. A small bridge over a stream on the wonderful coastal path walk to Tenby. The early May spring bank holiday proved to be the start of the one of the longest stretches of fine weather I recall in the UK. Five of the seven nights benefited from clear skies, with a sixth cut short not long after dark by a bank of rolling fog that wasn’t forecast, and would not have been out of place in a horror movie. The fog stubbornly only cleared by late afternoon the following day. Only one day was blighted with rain. 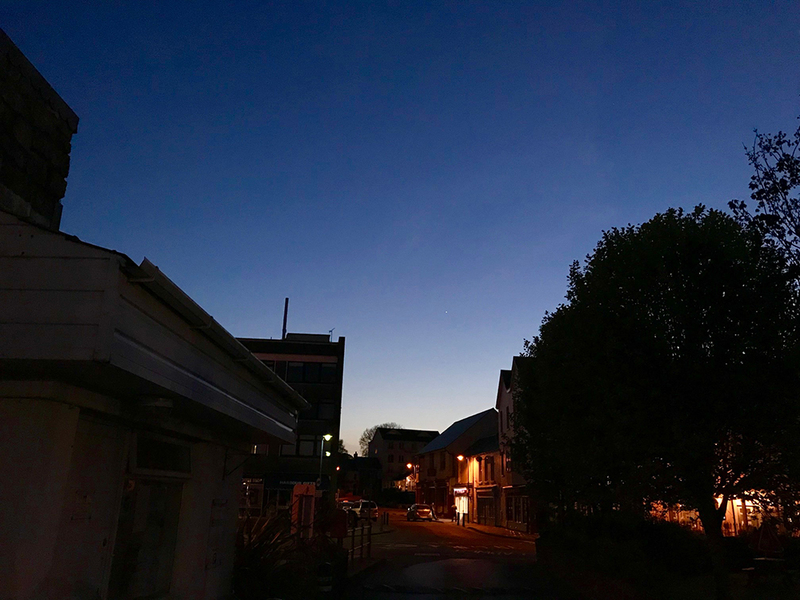 The evening star of Venus shines brightly in the west on yet another clear night in Saundersfoot. 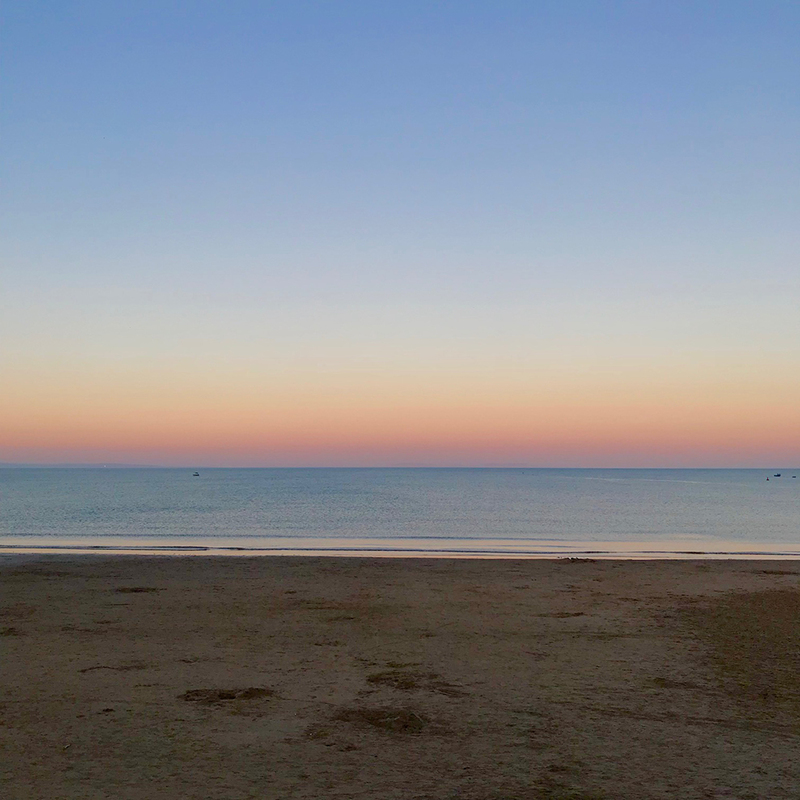 Compared to our central London home, almost anywhere benefits from good night sky conditions, and Saundersfoot is decent, without being exceptional. I estimated the limiting magnitude to be around +5 to 5.5 at the zenith and fortunately our visit coincided with the period from third quarter to new Moon which kept that natural source of light pollution, mostly out of the way. To its detriment, a pub which is a few doors down from the apartment has installed lighting in its beer garden which backs onto the beach, which somewhat interfered with views to the north, though fortunately the lights were on timer and thankfully switched off at midnight. 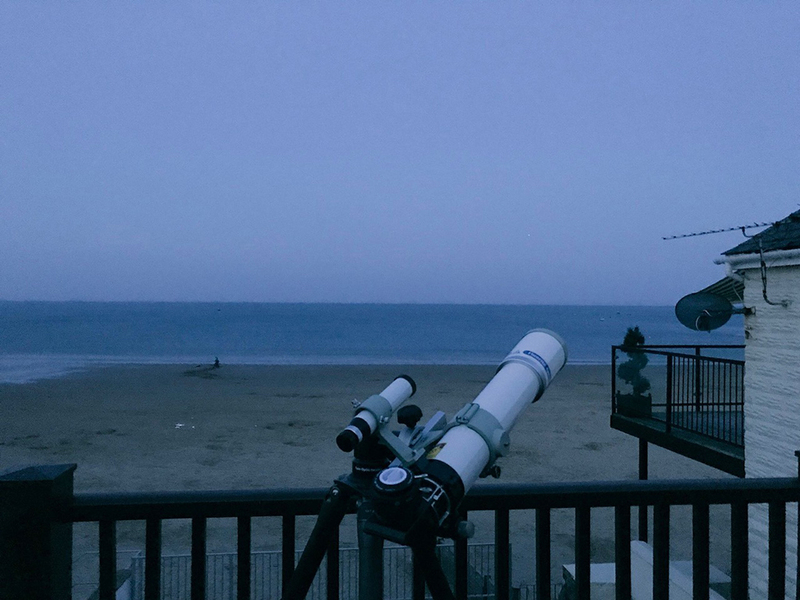 The beach itself would also be good for stargazing and allow escape from those lights, though while there a decent amount of beach left at high tide, during a spring tide, it all but disappears, with the waves lapping against the lowest level of the terrace. I imagine venues outside of the main resort would be superior. 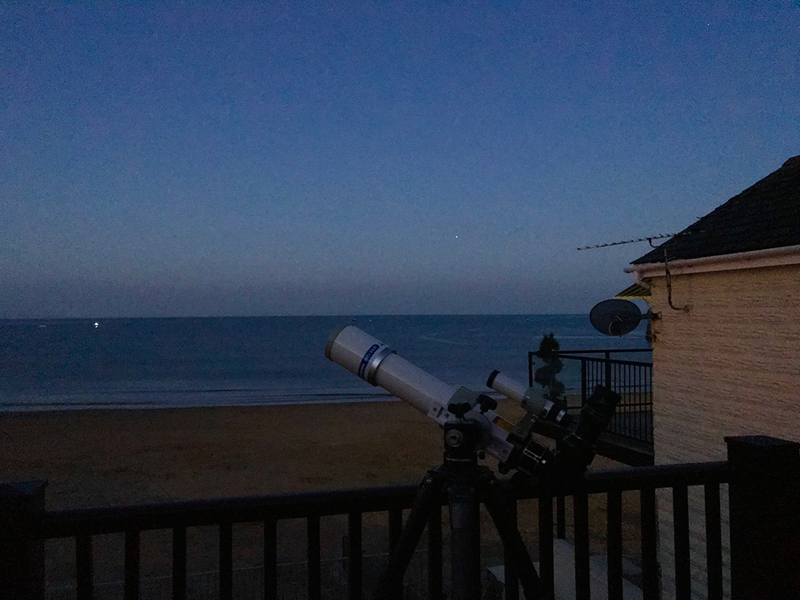 The FC-76 at dusk waiting for the king of the planets to appear in the east. 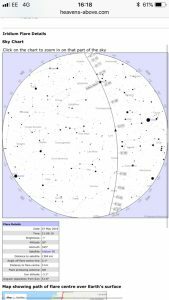 While I was able to stargaze almost every night, one in particular stood out for both transparency and tranquillity, and that was Monday May 7th and that is the night detailed below. On this particular night, I used the Takahashi FC-76 in its base configuration without the 1.7x CQ module installed. Sunset was around 8:50pm, and not long after brilliant Jupiter was easy to spot in the east. Rapidly approaching the longest day of the year, astronomic dusk was not until 23:36, but in reality, the sky was dark enough for some decent DSO observation after nautical dusk, more than an hour earlier. I set up the scope fairly early to allow it to cool, but also so I could take advantage of a GRS transit not long after the planet cleared the horizon. Even though the gas giant remained below 10o altitude, the view using the 3-6mm Nagler Zoom was remarkable sharp. Several clouds bands, and some dark storms and festoons were visible, as was the delicate salmon pink GRS, that would soon slip round the edge of the planet. I revisited the Jovian world several more times during the course of the night as the seeing conditions remained exceptionally stable. As always, I had checked Heavens Above for details of any Iridium Flares or ISS passes during our stay. A rather impressive prediction of a magnitude -7 flare was forecast for early evening. While I have seen flares of this brightness before, I was sceptical I would be successful this time as the Sun was less than 2o below the horizon and the sky would still be very bright. Despite having a clear view towards the north and the predicted flare altitude of 30 degrees, the time came and went and I was unable to visually locate any indication of the passing communication satellite. Disappointing as it was, I did not consider a wasted endeavour as opportunities to witness these flares are diminishing rapidly as the fleet of satellites are decommissioned. Though Orion and the wonderful Messier open clusters of Auriga had been lost to the roof line to the north west, Gemini and Cancer were still in play, so continuing to use the zoom, I panned up to the head of the twins to take in the classic double star, Castor. Though holding the Bayer designation Alpha, Castor is in fact the second brightest star behind its “twin” Pollux. Using the 6mm setting (95x), the two white stars were nicely separated hard points of light with channel of black space between them. While Castor presented a nice view, in reality I was intending to use as a starting point to jump to M44, the Beehive Cluster. With the sky still not dark, I felt the view would still be dramatic, and they were both at approximately the same altitude of 40 degrees. Switching to the 14mm Delos (41x / 1.7o), I panned 25o to the east and came straight to the boxy cluster. Even in a sky that was not yet dark, the view was spectacular with what seemed to hundreds of tiny pinpoint stars swarming around the central box of stars which always stands out to me. Next up on my target list was the globular cluster M3 in Canes Venatici. Though one of the three brightest GCs in the northern sky at magnitude +6.2 and hence visible to the naked eye under a dark sky, I was unable to detect it visually. I have always found that M3 sits in a region of sky with no nearby bright stars to use as starting point for a quick star-hop. However, at this time Arcturus was 12o south in altitude and 2o east in azimuth, such that using the 24mm Panoptic, and placing the fourth brightest star in the sky near the field stop, I was able to pan straight up and locate my quarry. Switching to the 6mm, the cluster had a bright, dense core around 2’ in diameter, and there was substantial grainy mottling across the circular face which faded uniformly in all directions into interstellar space. An incredibly vivid Belt of Venus seen on the first night of our vacation, a few hours before thick fog rolled in. Staying with globular clusters, another northern showpiece was well placed for viewing, M5 in Serpens. An easy hop west from Unukalhai (Alpha Serpentis), the cluster is a close rival for M13 and I decided to switch down to the 7mm to have more clear sky for better framing. Once again, the cluster exhibited a bright central core with granulation extending away from the centre with a slight spiral structure. Near the periphery, I felt was beginning to resolve individual stars, especially with averted vision. Keeping with the theme of some of the oldest structures in the universe, I next panned over to the constellation that harbours another two of the more prominent examples in the northern skies, Hercules. Starting with easy to locate M13, inside the keystone asterism, the GC was obvious in my 8×30 finder. Using the 7mm, the central quarter of the field was a mass of stars with a bright core, and plenty of granulation across the surface. The dark propeller feature, which is often not obvious in long exposure photographs really drew my eye. I was also able to resolve some of the brighter members of the cluster. Located in almost any other constellation and M92 would be showered with more plaudits than it is, but as the poor cousin to M13, it does not receive the attention it might otherwise deserve. The cluster appeared fairly compact with an eye-drawing central core, surrounded by an asymmetrical halo which showed some mottling and granulation. However, unlike some darker sky sites I have visited, I was unable to resolve any component stars. I decided then to shift my attention away from GCs and to the structures that harbour them, galaxies. Five were very much the focus group, the first three visible in a single field, and the final two, also seen in a single view. Leo was still well placed in the south west, and its famous triplet still above 40-degree altitude. Easy to locate, following a straight line between Chertan and Iota Leonis, the Leo Triplet has developed something of a reputation among London based astronomers as the “Leo Doublet” with NGC 3628 proving as invisible as it was to Messier when he was searching for comets. While the view could hardly be described as spectacular, all three galaxies were glimpsed, with their differing orientations obvious, and evidence of dark dust lane in M65 near the edge and stellar nucleus in M66. A straight through finder combined with a less than neck-friendly 65o altitude resulted in some contortions to line up M81 and M82 in Ursa Major. However, it was worth the effort. Both galaxies were contained in the 1-degree field of the 7mm Nagler. M81 is certainly one of the more photogenic galaxies to be found in the heavens. Though the view was not quite on the level of a photo, the central core extended a couple of arcminutes across in the centre of diffuse elongated patch of light of approximately 15-20’ x 7-10’. Using averted vision, I was able to detect hints of the beautiful spiral arms which are shown so well in larger instruments. A fabulous main course served at Coast. Offering an incredible contrast in morphology, starburst galaxy M82 is my preferred of the two given the interesting structure on show. Known colloquially as the Cigar Galaxy, thanks to its long, thin shape, I actually find my imagination seeing it more as a flame above the wick of candle thanks to the dark lane that severs the core of the galaxy in two, with the flame appearing to come to point, where as the equally sized, but boxier half representing the top of the candle. After a galaxy fix and low to medium powers, it was time to switch to the zoom for some high magnification views of view more double stars. First up was the classical example of colour contrasted stars, Albireo in Cygnus. While observations from Gaia have now confirmed that the beautiful double is nothing more than a chance alignment in the sky, the two colourful stars, of golden-yellow and electric-blue, were beautifully presented using the 6mm setting for 95x. Staying within in the Summer Triangle, my next target was the Double-Double in Lyra. Using the 5mm setting for 114x, resulted in hair-split of the two component stars into their separate suns, showing clearly the different perpendicular orientation of each pair. The view was improved further by moving to the 4mm setting. Last up was another excellent example of colour contrast with Epsilon Bootis. Better known as Izar, it is the second brightest star in the constellation of Bootes. Considered a good challenge for a 3” scope, it is not so much the 2.9” separation, but combined with the almost three magnitudes difference between the components ups the difficulty level. The primary star is a K0II class star which appears bright orange, where as the dimmer companion is a white A2V star. While some colour contrasts are real and others are just perceived, there is a real colour difference in Izar, though I actually see a slightly green-hue to the secondary which is probably more a feature of my eye. The split was best enjoyed using the 4mm setting and in my opinion was the prettiest of all my double star targets that night. I certainly agree with its discoverer, Struve, who called the pair “Pulcherrima” which means the most beautiful. 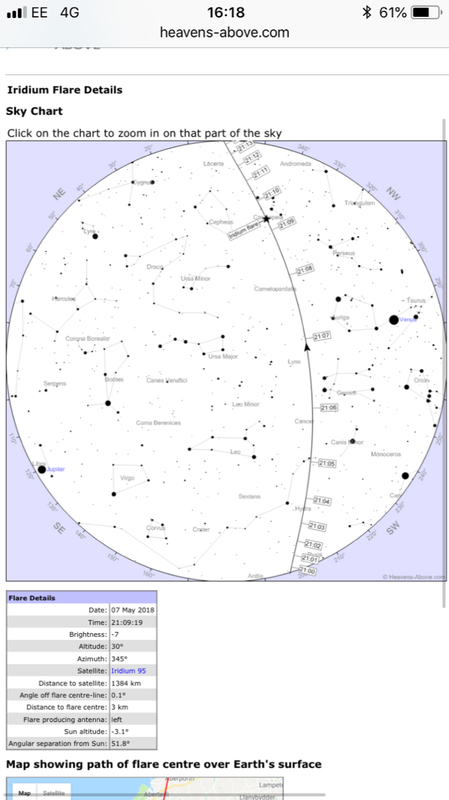 Moving back into the domain of the Summer Triangle with the 7mm, next up was the most famous denizen of Vulpecula, though I always hop to it from Eta Sagittae, the end star in the celestial arrow. Displaying a delicate green glow, the central core of the planetary nebula showed a twisted, tubulent structure which fanned out to lobes which slightly turned back on themselves. Of all the planetary nebula I have viewed, M27 arguably presents a view which is closest to that of a long exposure photo. The Takahashi FC-76 with Jupiter rising in the East. Staying with the remnants of sun-like stars, my next target was M57, the Ring Nebula in Lyra. Located midway between Sulafat and Sheliak at the bottom of the harp, the tiny grey annulus floats against the rich Milky Way, appearing as a smoke ring that looks like it is about to dissipate. Using adverted vision, the ring appeared to be criss-crossed with dark streamers of material. I have seen this before, but it is not a feature that seems to manifest in astro-photos which has left me thinking it is likely variations in the brightness of the ring rather than actual dark material obscuring the glowing ionised gas of the expanding envelope. Next up on my target list was a DSO, that until recently, courted controversy in the astronomical community, M71 in Sagitta. Is it a loose globular, or a tight open cluster? Analysis has concluded it is a nearby globular, at only 13,000 light years away. Displaying a slightly fan-like appearance, I was unable to resolve stars all the way across the cluster, but a uniform density with mottling was seen with no visible central condensation that is normally seen in GCs. Before leaving the Triangle, I switched in the 24mm Panoptic and then swept up to Collinder 399, better known as Brocchi’s Cluster or the Coathanger. The distinctive pattern of the ten brightest stars that map out the well-known shape that gives this object its name was obvious. What really drew my eye was the one orange star which contrasts strongly with the blue-white tone of the other nine. One object had been calling out to me for some time, and finally I gave in to temptation and swung my scope round to Cassiopeia in the North. Though located in Perseus, a line extending from Navi and Ruchbah in ancient queen point straight to the Double Cluster. Right on the limit of averted vision naked eye, both NGC 869 and 884 were obvious in the 30mm finder. The twin clusters completely filled the 1o field of the 7mm, with hundreds of blazing stars vying for my attention. The splendour of this object is even more impressive when considering that the light of the cluster members shines through thick interstellar dust clouds on its way to our scope. Were it not for the dust, the cluster would appear more than 4x brighter. As well as the distinctive horseshoe shape in the heart of NGC 884 which wraps around a ruby coloured star, I find the subtle variations of colour across the cluster, with blue sapphires, white diamonds, yellow topaz and rubies make me think of spilled plunder of a pirate’s treasure chest. Panning back to Ruchbah, my intended target is incredibly reminiscent of one of Spielberg’s most famous creations. Caldwell 13 (NGC 457) is also known as the Owl Cluster, but all I can see is the famous friendly alien who wants to get home. The two blazing eyes are immediately obvious, with the stick figure outline of a welcoming body easily traced out by the dozens of cluster members that were resolved in my 3” scope. The body appears fleshed out by the numerous additional dimmer members that are not quite resolved in my Takahashi. Last up for the night was something that I thought was a long shot given the sky conditions. NGC 7000 (C 13) isn’t particularly challenging under a dark sky with good binoculars, but I find its delicate glow is lost to any light pollution. Using the 24mm, I was unable to convince myself that I was able to see any part of the north American continent that is so apparent in photos of this region of the sky. Not quite ready to concede defeat, I screwed in my UHC filter and tried again. While the full extent was still beyond my grasp, the brightest area which delineates the Gulf of Mexico region was there to be explored. Satisfied with a good session I decided to retire for the night, knowing that the forecast was looking promising for the following night and I would likely have the opportunity to visit more familiar favourites. 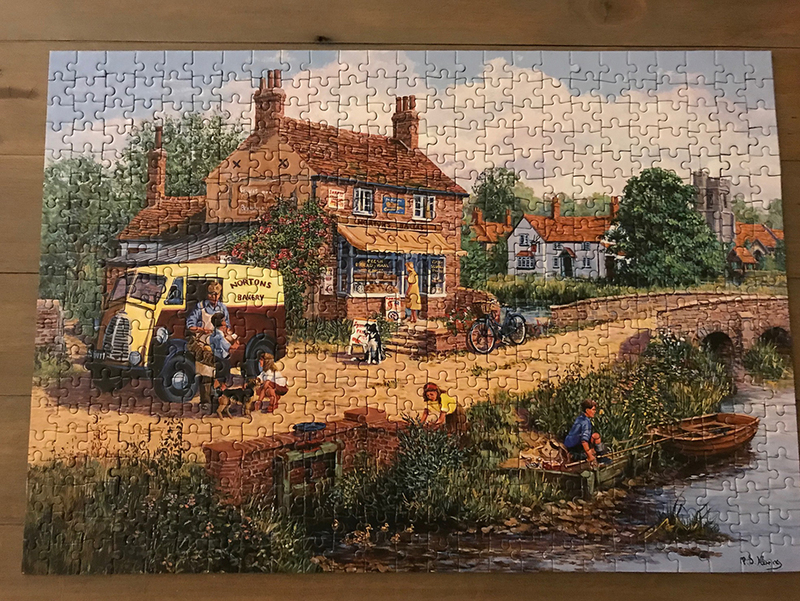 Despite some protest from my wife, we completed a 500 piece puzzle we found in the apartment on the rainy day. The first I have tried in probably a quarter of a century. 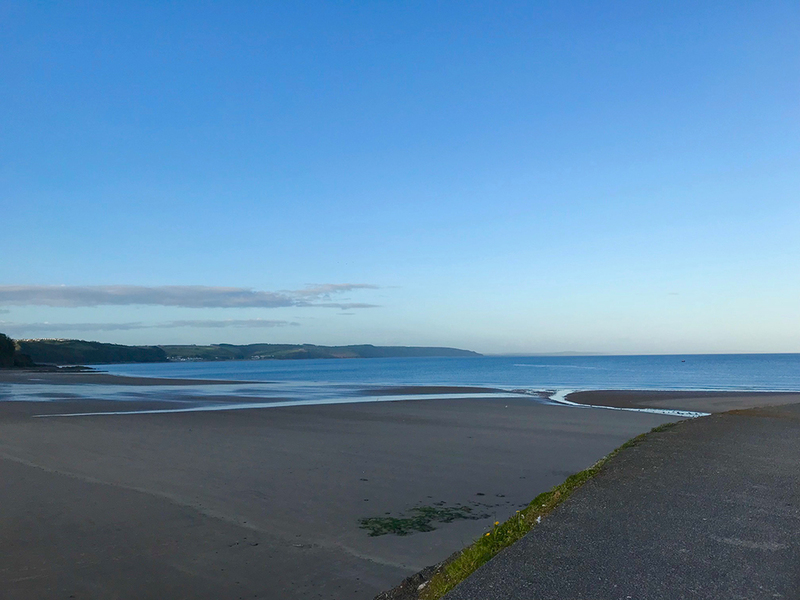 Saundersfoot is a wonderful location for a short domestic vacation, especially if you are a gourmand and enjoy walking. 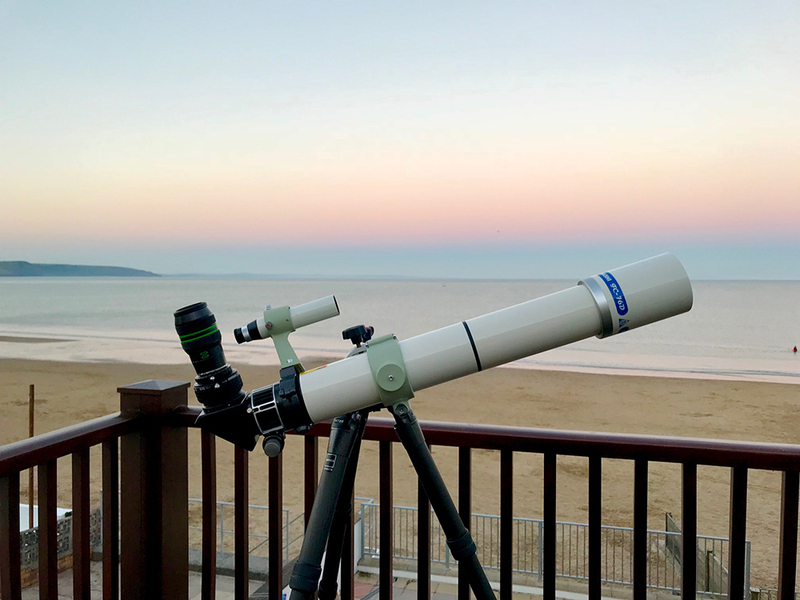 While certainly not the darkest skies in the UK, the coastal resort is still capable of offering some pleasing stargazing and I imagine journey times would be short to find some very dark skies. We both thoroughly enjoyed our two visits, and could easily imagine a third in the future and I will certainly take a telescope again if that should happen. Tagged astronomy, Coast, Coast Restaurant, FC-76, pembrokeshire coastal path, Saundersfoot, stargazing, Takahashi, Tenby.